Allegations of sexual harassment — many of which investigators found to be credible — made legislators' work especially difficult in 2018. Democrats and Republicans couldn't agree on most major health policy issues, although they did cooperate to pass several bills on substance use and mental health. Democrats hope to gain control of the state Senate from Republicans in the November election, which could pave the way for dozens of Democratic health bills the Senate rejected the past four years. Legislators are used to bare-knuckled political fights, but this year was something else. For the first time in more than a century, the House of Representatives expelled one of its members. He had been accused of sexually harassing several women, including a House colleague. A senator accused of sexual harassment survived an expulsion vote. Four other legislators faced harassment complaints. The resulting tension strained the personal relationships that lawmakers depend upon to do the state’s business. Even so, legislators made headway on top-tier issues that had vexed them in past sessions. They funded construction of rural broadband lines, and they added money to the transportation budget — though it is short of what’s needed to repair Colorado’s highways. Health bills did not fare as well. The exceptions were measures that responded to the high-profile drug overdose crisis. Some bills addressing mental health — especially among jail inmates — also succeeded. But multiple attempts to address the price of health care and insurance were brushed back. Click on the report cover to download our full report, featuring capsule descriptions of more than 50 health-related bills and an expanded look at the politics of 2018. Also, download our full bill tracking list here. Here are the five health policy themes the Colorado Health Institute identified in the 2018 legislative session. Five of the six bills from a 2017 interim committee charged with addressing the substance use epidemic made it to the governor’s desk. Despite the failure of a bill to allow a supervised drug injection site, this was the biggest health policy success story of the session. Legislators finally found some consensus regarding greater price transparency at freestanding emergency departments, but every other major pro-transparency bill related to health — from drug pricing to hospital financial reporting — failed this session. While we once again saw attempts to rein in insurance cost growth, every notable effort failed. But bills focused on reinsurance, premium subsidies and geographic rating regions kept the conversation front and center and may position the General Assembly to enact changes in the near future. Legislators considered many bills focused on mental health and worked together to take some promising steps. But politics and philosophical disagreements derailed several suicide prevention measures. Environmental health, especially climate change and oil and gas issues, is increasingly in the spotlight at the Capitol. With the exception of a measure updating the Governor’s Energy Office, no bills tackling this topic passed in 2018, but the issue is sure to be back next year — and hotter than ever. In addition to election-year politics, legislators were dogged throughout the session by the distractions and tension resulting from sexual harassment allegations. Members of both parties and both chambers were accused, and independent investigations substantiated many of the accusers’ claims. Things came to a head with two votes on expelling legislators. One was successful, the other was not. Members of the House voted on March 2 to kick out Rep. Steve Lebsock (D-Thornton), who faced credible accusations of sexual harassment and retaliation against several women. A fellow lawmaker was one of the accusers. Going into the floor debate, Democrats didn’t believe they had enough support to expel him. But after seven hours of emotional testimony, they were joined by 16 of the 25 Republicans present in voting to remove him from office, easily clearing the 44-vote hurdle. Democrats — including Senate Minority Leader Lucia Guzman of Denver, who abruptly resigned her leadership position in March — cited frustration throughout the session with the refusal of Senate President Kevin Grantham (R-Cañon City) to discipline Republican senators accused of sexual harassment, especially Sen. Randy Baumgardner (R-Hot Sulphur Springs). But Grantham surprised legislators on April 2 when he announced that the Senate would debate and vote on Baumgardner’s expulsion that evening. Twenty-four votes were needed to remove him, and the move failed 17-17. Baumgardner was later stripped of his committee positions by leadership. The discomfort and frustration went beyond legislators. An outside review of the atmosphere at the Capitol found that one-third of the 500 or so people surveyed have seen or experienced harassment there, but only a small fraction said they would feel comfortable reporting it. In response, a bipartisan committee of legislative leaders recommended that a summer working group look into the issue rather than making changes before the session ended. Several lawmakers, including Reps. Jon Becker (R-Fort Morgan) and Yeulin Willett (R-Grand Junction), have decided not to seek reelection this fall, with the negativity at the Capitol seemingly a major driver of their decisions. 1 Legislator leaves her party prior to session. 1 Legislator resigns her leadership position during session. 1 Legislator expelled in House, and switches parties moments before. 1 Legislator survives expulsion vote in Senate, but is later stripped of committee assignments. 6 Legislators formally accused of sexual harassment. Legislators enjoyed something in their 2018 budget they rarely get: options. The General Fund grew by $1.3 billion over the previous year’s level, the most robust growth in a decade. Health care, however, largely missed out on the windfall. The legislature followed Gov. John Hickenlooper’s wishes to spend most of the new money on three big items: K-12 schools, transportation and the Public Employees Retirement Association (PERA). No one had proposed any major health care initiative that required tax money, so health programs mostly maintained the status quo. One partial exception is the approval of an inpatient substance use treatment benefit in Medicaid, but the biggest costs for that program won’t arrive until at least two years from now. Legislators also set aside $6.5 million for other substance use legislation (see pages 10-11). 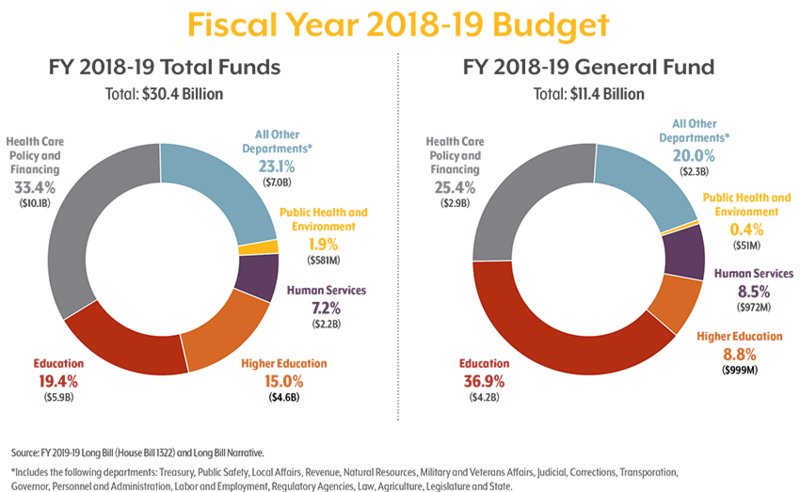 The Department of Health Care Policy and Financing (HCPF), which runs Medicaid, will get a modest 2.5 percent increase, bringing its total budget to $10.1 billion and keeping it the state’s largest agency. Despite a recent drop in Medicaid enrollment — down to 1,278,000 in April — the department predicts enrollment will grow to 1,350,000 for the 2018-19 budget year. Meanwhile, Medicaid members are getting older, which is driving an increase in the per capita cost of covering enrollees, according to the legislature’s budget summary. The projected growth in these two areas is responsible for most of the cost increase. For the second straight year, the culture war over public health remained in a state of truce. There were no serious attempts to defund immunizations, contraception programs, health surveys or school-based health centers. Conservative Republicans had targeted those topics as recently as 2016. • House Bill (HB) 1322: 2018-19 Long Appropriations Act. This bill, coming in at more than 600 pages, sets the budget for all state agencies through June 2019. • HB 1327: All Payer Claims Database. The bill gives an important new revenue source to the insurance claims database by setting aside $1.5 million from the General Fund and another $1 million in federal money. The database had relied on grant funding that is about to expire. The state Capitol’s three main power centers have existed in an uneasy balance over the past four years. Republicans hold a one-seat majority in the Senate, Democrats run the House, and Hickenlooper, a business-friendly Democrat, occupies the state’s top office. At least one of those power centers will change after the November election. Hickenlooper is term-limited and will leave after eight years. Democrats and Republicans will choose their candidates to replace him in the June 26 primary election. The race has drawn more credible challengers than Colorado has seen in a long time. The Democratic primary ballot has four names: former state Sen. Mike Johnston, former state Treasurer Cary Kennedy, Lt. Gov. Donna Lynne and U.S. Rep. Jared Polis. Republicans also have four candidates: former Parker Mayor Greg Lopez, former state Rep. Victor Mitchell, businessman Doug Robinson and state Treasurer Walker Stapleton. A November victory by any of the Democrats would shift the state’s health policy to the left. All four have called for a public insurance option or other government-sponsored insurance. Republican candidates have been less vocal about health issues, although Stapleton has called for dismantling Connect for Health Colorado, the online insurance marketplace. If Democrats can pull off a sweep — winning back the Senate while holding on to the House and governor’s office — then look for a lot of bills that failed the past four years to be resurrected in 2019. Health legislation, in particular, often passed the House and died in Senate committees. For example, a Democratic Senate majority likely would have passed a reinsurance program and a study of a Medicaid public option. Following the work of the 2017 Interim Committee on Opioid and Other Substance Use Disorders, which voted to introduce six bills (described below), it was clear that efforts to address the opioid epidemic would be top-of-mind for lawmakers this session. Senate Bill (SB) 40, to allow a supervised injection site, was disposed of in mid-February — but the rest were not decided until the final few days of the session. At various points, progress stalled, and other budget priorities seemed to elbow ahead. But five bills passed, and the package’s 83 percent success rate is one of health policy’s biggest wins in such a partisan year. The most surprising success of the opioid bills, HB 1136 directs the state to pursue a federal waiver to add residential and inpatient SUD treatment and medical detoxification services to the list of Medicaid benefits. The bill’s champion, Rep. Brittany Pettersen (D-Lakewood), convinced her colleagues to focus on the manageable costs to develop the program next year, rather than on the predicted $34 million net budget impact in fiscal year 2020-21. Hickenlooper signed the bill into law but included a letter that noted the large proposed costs and lack of treatment facilities. The letter asked hospitals to expand their services to meet the need. For several years, legislators have made health care transparency a major topic of discussion. We saw new versions of previously failed bills to address hospital costs, pharmaceutical pricing and freestanding emergency departments (EDs). Legislators managed to find consensus on old ideas about freestanding EDs, showing that persistence can pay off, but they didn’t agree on much else. Hospitals were on the hot seat, but largely defended themselves from attempts to open their books and publish an exhaustive list of their services and prices. The lesson? Lauding the value of transparency is easy, but agreeing on actual policy change is hard. The bill would have required almost all health care providers, including hospitals, surgical centers, community clinics and physician groups, to publish their charges for health care services and include detailed price breakdowns on patients’ bills beginning in 2019. It also would have required pharmacies to publish a list of retail drug prices and insurance carriers to share additional information about contracts and pricing. The far-reaching bill failed overwhelmingly in committee (12-1), but backers are working to get it on the statewide ballot so voters can have the final say. If transparency stumbled this session, cost control fell completely flat. Despite the lack of progress on bills, however, legislators seem to be inching forward on reining in high and rising insurance prices. Some ideas were recycled from previous legislative sessions, while newer concepts, such as creating a reinsurance program or instituting Medicaid work requirements, emerged. Various pieces are now on the board — and the next moves will depend heavily on the outcomes of the election in November. HB 1392 would have directed the state to apply for an Affordable Care Act (ACA) waiver to establish a reinsurance fund. The fund would have helped insurance carriers pay for high-cost customers, with the idea that insurers could in turn reduce premiums for the rest of their customers who purchase insurance on the individual market. Alaska has been operating a similar model with well-documented success. Would have directed HCPF to submit a waiver to the federal Centers for Medicare & Medicaid Services (CMS), which would require able-bodied Medicaid enrollees to be working, seeking work, or enrolled in school or a job-training program. Such requirements have been pursued recently in other states and caught the eye of two Colorado Republicans as a means to reduce costs and encourage personal responsibility. In addition, the bill would have required able-bodied adults to verify their income eligibility each month and established a five-year lifetime limit on Medicaid benefits for nonexempt enrollees. Colorado legislators struggled to decide how — and if — to fund suicide prevention efforts. Three bills supporting suicide determent for youth failed in the Senate, largely due to philosophical disagreements over the appropriate role of government in addressing social problems. There was some progress, however. A bill provided funding for a new school-based suicide prevention program, and legislators agreed to create a behavioral health ombudsman position and support efforts to better link people in the criminal justice system with behavioral health care. In the final weeks of the session, a group of Senate bills addressed the connection between behavioral health and the criminal justice system, including jails and courts. The issue received funding commitments during the state budget debate. One measure addressing competency evaluations, SB 252, failed when Sen. Irene Aguilar (D-Denver) blocked a vote on the final evening, while several others passed. In Colorado and beyond, conversations are building about the intersection of climate change, energy and health. Health policy researchers are increasingly studying these linkages, following the American Public Health Association’s declaration of 2017 as the Year of Climate Change and Health. But for all the hours of debate in committee and on the House and Senate floors, only a couple of energy-focused bills passed. The rest were mired in partisan disagreement. Makes changes to the Colorado Energy Office and its responsibilities through repealing several mostly inactive programs and creating new requirements, such as adding nuclear and hydroelectric power to the list of energy sources the office must promote. Not all health policy legislation fit neatly into one of our five categories. Notable bills tackled subjects from rural broadband and public health to interstate licensure and pharmacy choice. Here’s a sampling of what we watched during the session. Would have required health insurance carriers to cover emergency services that are provided out-of-network at in-network benefit levels. For nonemergency services, SB 237 would have strengthened existing requirements for notifying patients. The first bill signed into law this session, SB 27, was rushed through to meet a January 19 deadline. It allows new nurses to practice in any of 27 licensure compact states without needing a state-specific license and maintains licenses for 86,000 nurses who would have otherwise had to reapply and undergo another background check. By enabling nurses from any participating state to practice in-person or via conference call or computer link, Colorado hopes to reduce its nursing shortage. Allie Morgan joined the Colorado Health Institute as a Policy Analyst in July 2014. She is now the Director of Legislative Services.